Relief is a Simple RUB AWAY! When pain starts anywhere in your body, your natural instinct is to rub the pain away. And for a brief moment you experience sweet relief. But once you stop rubbing, the pain returns. If it really hurts you may pop a pain-relieving pill or two… but long-term use of these oral medications can cause nasty side effects such as nausea, bruising or internal bleeding. But what if you could safely add soothing pain relief right to the end of your fingertips? So the next time you naturally rub a sore spot, you get pain relief that lasts… and without the dangers of pain pills! Well now you can… with Rub On Relief® The fast-acting, non-toxic, anti-inflammatory, long-lasting pain relief cream that works! When you’re in pain, you want to get rid of it fast. No waiting around for pills to absorb or for smelly creams to sink in. You need relief that works the first time… every time. The moment the first soothing dab of Rub On Relief® cream hits your skin you’ll know it’s different… better. First off, it doesn’t have a nasty medicinal smell. It has a pleasant — but faint — citrus scent that doesn’t linger. It absorbs quickly and penetrates deeply. You’ll feel the ten miracle pain-relieving nutrients rushing to your pain points to get rid of pain fast. It starts working long before you can even swallow your first pain pill. Now that’s speed relief you won’t find anywhere else. 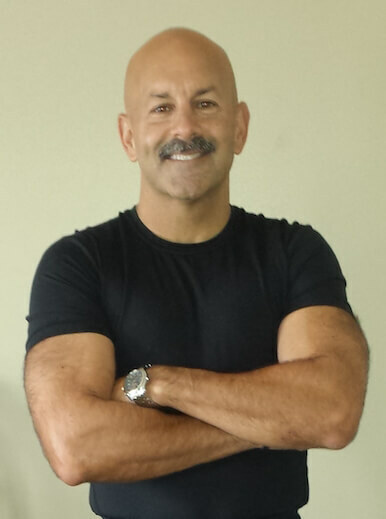 I’m co-founder of The Healthy Back Institute®. My mission in life is to eliminate the pain from your body and restore the vigor and delight of living you think pain has robbed you of. That’s why I created Rub On Relief®. After scouring through endless clinical trials and studies, I was determined to bring you a formula with only the best natural ingredients that have been proven to work to relieve your pain quickly… every time you use it. I found ten effective ingredients that work together to block virtually every type of pain. No other formula contains such a powerful smorgasbord of pain-relievers in one easy-to-apply cream. In fact, one pain-stopping ingredient I found was tested in a clinical trial… and gave relief to 100% of the study’s participants! This breakthrough is so effective I made it the cornerstone of my formula. I’ve Never Seen a Solution Give Relief To So Many People! A scientist working for the National Institute of Health noticed that lab mice never contracted arthritis. There was something in their blood that made mice immune. That substance was a rare fatty acid known as Cetyl Myristoleate or CMO. He quickly developed a method of making it in the lab. When the scientist contracted arthritis himself, he mixed up a batch and used it for his pain. He claimed it stopped his pain for good! Other scientists rushed to conduct studies to see for themselves. And the results were simply jaw-droppingly astounding! Scientists at the University of Connecticut gave CMO in topical cream form to patients experiencing joint and muscle pain in one or both knees. And 100% of the study’s participants who used this powerful ingredient felt relief from their pain. 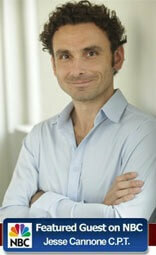 At a patient study at the San Diego Clinic, CMO was found to reduce pain and significantly improve mobility. A double-blind study at the Joint European Studies Program revealed everyone who took the CMO experienced up to 87% improvement in pain relief. The Journal of Rheumatology reported on a double-blind study of patients with chronic knee osteoarthritis where the CMO group saw significant improvement while the placebo group saw none. In fact, the scientists were so impressed with the results they concluded CMO "may be an alternative to the use of non-steroidal anti-inflammatory drugs for treatment of OA"! In a study of 1,814 arthritis patients, every patient (except the few with liver damage) benefited from using CMO. Over 87% of the subjects had greater than 50% recovery and over 65% of those showed from 75% - 100% recovery. 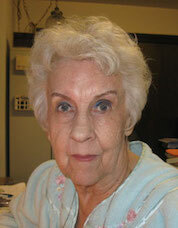 All types of arthritis were positively affected by CMO. These are just a few of the long list of studies that have shown the incredible pain relieving power of CMO. This fatty acid acts as a “moisturizer” on dry and brittle joints. It cushions the joints and repairs cell membranes. CMO penetrates directly into your muscles, tissues, tendons and joints to quickly turn off the fires of chronic inflammation and relieve your pain at the source. And if it works so well on throbbing joints, imagine what it can do for your aches and agonies. But we didn’t stop there. For centuries, healers around the world have combined therapeutic nutrients like these for fast and safe pain relief. As powerful a nutrient as CMO is at relieving pain, it can be even greater when combined with other ingredients. Doctors Call it “The Natural Solution to Pain”! The 13 ingredients in Rub On Relief® work together to help your body eliminate even your most stubborn aches and pains ! While CMO is one of the rarest substances to occur in nature, the next nutrient in the Rub On Relief® formula is one of the human body’s most common. In fact, it is the fourth most abundant mineral in your body. It’s called Methylsulfonylmethane or more commonly MSM. It’s a naturally occurring nutritional sulfur. MSM makes the body’s cells more permeable which allows nutrients to flow in and out. That’s because it works two ways to naturally relieve your pain. First, it blocks the “c” pain nerve fibers from delivering their chronic pain message to your brain. Secondly, MSM decreases swelling and inflammation often the cause of painful flare-ups. And to make our exclusive formula a pain-busting dynamo, we added 12 more of the Mother Nature’s best pain-fighting ingredients. Added to Stop Pain Fast! White willow extract contains salicin (salicylic acid), the active ingredient in aspirin. Salicin is also known as “Mother Nature's Aspirin.” White willow extract is known as an effective anti-inflammatory and analgesic (pain-reliever). It helps relieve aches, pains, and tension headaches. Perhaps there’s nothing more painful than sudden painful muscle spasms. Well there’s nothing more fast-acting at stopping muscle spasms and twitching than this vital mineral compound. For centuries, European herbalists relied on Arnica flowers to help decrease pain and swelling. Studies show arnica also helps lower pain levels and reduce bruising. Arnica is also used to help patients deal with pain after specific surgeries. Curcumin C3 Reduct® is a patented form of the effective natural anti-inflammatory curcumin (turmeric). Scientists isolated and extracted the tetrahydrocurcuminoids (THCS) — the metabolites that give curcumin its anti-inflammatory power — from the root. Then, they turned this extract into a highly concentrated form. The result? Improved bioavailability, greater absorption, and better pain-relief. Lemons and limes are known for their powerful antiseptic and antioxidant properties. These two citrus oils also give Rub-on-Relief a non-medicinal, pleasant smell that’s not overpowering. Calendula is a plant that’s been used traditionally as a medicinal herb. Calendula contains a bioactive compound called sesquiterpenoids. Sesquiterpenoids has been found to be antimicrobial and have anti-inflammatory properties. Peppermint leaf oil is an ancient herbal medicine used in Europe and the Middle East to rapidly provide cool relief to aching muscles. Peppermint leaf oil can also help relieve tension headaches, pain, irritability, and increase overall wellbeing. What’s more, peppermint leaf oil actually tricks the body with its cooling touch. It sends a cooling pleasing sensation to your brain that thwarts the stinging heat of inflammation. Camphor provides a pleasant warming sensation. It’s the perfect contrast to the cool relief provided by the peppermint leaf oil. The warm/cool sensation of camphor and peppermint leaf oil will feel amazing on any sore joint or muscle. You Don’t Have to Struggle with Pain One More Day! “I just have to live with this pain.” NO WAY! No matter what your “grin-and-bear-it” pain is… now you can rub the pain away in minutes. You’ll feel a little tingle and then… BAM! Soothing relief. For many years I worked as a personal trainer. Sadly, many of the people that I worked with were experiencing pain—mostly from injuries. The most common forms were neck and back pain. So during this time of training individual clients, I became an expert in people’s pain. I got really good at helping people identify why their body was giving them so much trouble in the form of pain. And it became my mission to help folks ease their terrible pain, regain mobility and do any activity they wanted to do. It’s why I started the successful Healthy Back Institute®. But my mission took me one step further. I wanted to develop a pain-relieving treatment that would work instantly to stop pain—any kind of pain people were feeling anywhere on their body. It took a decade but I finally discovered the best remedy that’s worked for tens of thousands of people. My breakthrough Rub On Relief® formula is the result of researching current biochemistry advances in eliminating pain, uncovering centuries-old pain-relief traditions from around the world… and combining the two with the latest in skin-absorption biology. With its ten ingredients and exclusive formulation, Rub On Relief® is truly the safest, most effective way to reduce and eliminate pain from your life forever. Remember, Rub On Relief® contains only non-toxic pain-relievers. It contains no chemicals, preservatives or junk that can be toxic to your body. Rub On Relief® has a safe track record. Tens of thousands of folks continue to use Rub On Relief® without reporting any negative reactions. 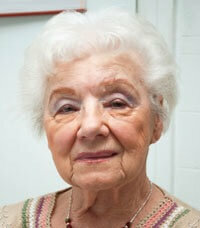 My kids over 10 and elderly family members use Rub On Relief® when they feel pain. It is so safe you can use it on your children or grandchildren age 12 and up. And because Rub On Relief® is a topical cream, you’re not swallowing pills that first have to pass through your stomach, kidneys and liver to get to your pain. Instead, you’re applying a soothing cream directly to any painful area on your body. The pain-relieving ingredients quickly pass through all 7 layers of skin to bring sweet relief in moments. So what have you got to lose by giving Rub On Relief® a try? Not a thing… especially when you can try it risk free for 30 days, 60 days, a full 90 days. That’s how much I believe in this product. If you don’t get the results that I’ve promised, then I’ll gladly buy back your tube of Rub On Relief® (plus any other unopened ones you return to us if you bought more than one). Be as Active as You Want to Be… FREE from Pain! 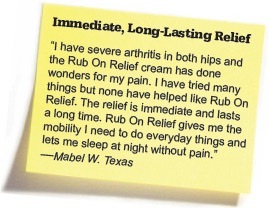 Now that you know how potent Rub On Relief® is to stop pain and increase your mobility, I urge you to give it a try. Wouldn’t you love to reclaim a pain-free life with a simple rub on of this powerful, fast-acting pain remedy? 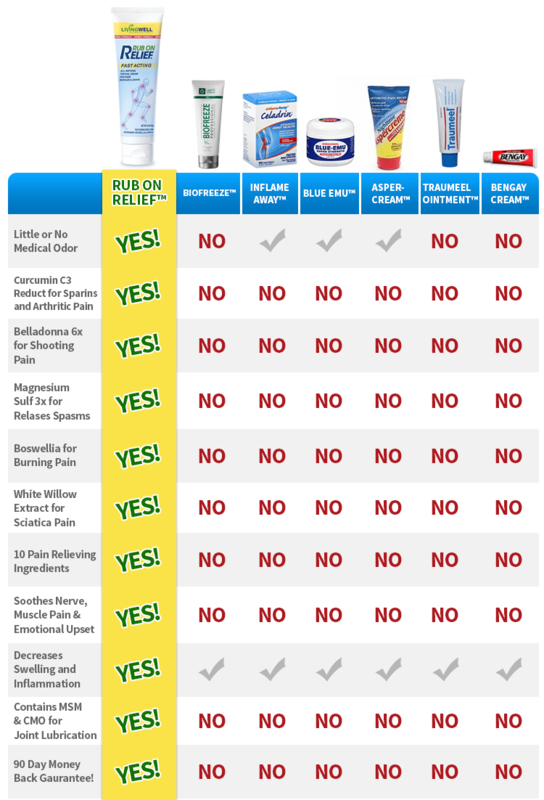 You won’t find Rub On Relief® in any health store or pharmacy. Instead, you can order Rub On Relief® directly from this website at the best possible price. In fact, one pain-relieving squirt of Rub On Relief® will cost you only 10 cents! Rub On Relief®stops pain dead in its tracks. It’s so effective you’re going to want to keep a tube at home, at the office, in your gym bag, in the car, in your briefcase or pocketbook or in your suitcase… so you can attack and defeat your pain instantly… anywhere. Plus, you’ll be so happy with the stunning results you’ll want to share a tube with your spouse or friends. We all know exercise is good for us, but ouch it can hurt. You could ache for days. So here’s a trick to stop pain before it starts… dab a squirt of Rub On Relief® on right after your workout… before the painful flare-ups. That way you’ll “short-circuit” the pain at the source. "It Works…And I Recommend It"
Author of the best seller "The Calcium Lie"
FREE BONUS, delivered immediately as a digital download, only available with select orders below. Discover how to get the maximum benefits of powerful pain killing ingredients in Rub On Relief®. Your order of Rub On Relief® is backed by my ironclad, 90-day money back guarantee. 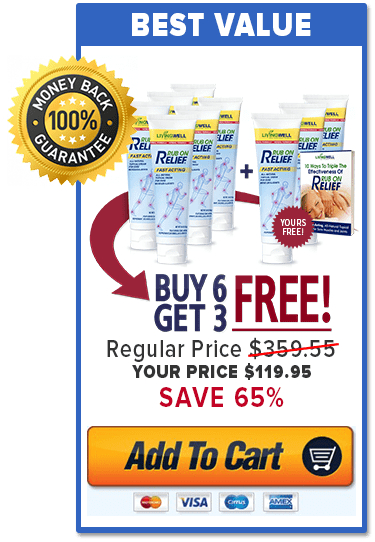 If Rub On Relief® does not stop your pain fast and give you long-lasting relief… or you’re unsatisfied in any way with the results you expect from Rub On Relief®… then simply return your tube - even if it’s empty! - within 90 days of purchase for a full and prompt refund of your ENTIRE purchase price* (excluding shipping). No questions. No hassles. No headaches. *Note: Multi-Tube Packages are not recommended for First Time Users. If you were to request a refund within the 90-Day Money Back Guarantee period, you would need to return all unopened tubes and we will refund a prorated amount based on the number of unopened tubes you have returned, less shipping. Your New Pain-FREE Life Begins NOW! With Rub On Relief®, there’s no reason for you or a loved one to spend another minute in pain. Because it contains non-toxic ingredients, no one has reported any adverse reactions that we know of. Because it’s easily absorbed through the skin, it works directly at the source of your pain. And because it’s backed by numerous clinical tests and studies, it works for practically everyone. It’s time to reclaim pain-free living once again and return to all the activities you enjoy… biking, hiking, gardening, golfing, writing, tennis, swimming… the possibilities are endless. What have you got to lose? Rub On Relief® will stop your pain and increase your mobility without the risk of pain pill addiction, nausea, or internal bleeding… plus you’re covered by my ironclad, 90-day money back guarantee. So take your first step today towards a pain-free life. Order Rub On Relief® now! P.S. Get THREE FREE TUBES! To make sure you can share Rub On Relief® with your loved ones or simply stock up at the best price, why not buy six tubes. You’ll get 3 tubes FREE and receive the lowest price per bottle. That’s 9 tubes total and you save a whopping 61%! Remember, you have 90 days to prove to yourself that Rub On Relief® really will relieve your pain and increase your mobility or I insist you request a prompt refund. P.P.S. Don’t spend another moment living with pain. Not when you can stop your pain NOW! Order Rub On Relief® NOW! Order Rub On Relief® today at up to 61% Savings! Click here. "Now I apply Rub-on-Relief® to my knees at the times when I experience pain and 5 to 10 minutes later my pain is completely gone and I can continue my work out without any problems. 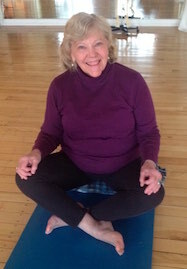 “Three-years ago I was given an MRI and diagnosed with spinal stenosis. I also have arthritis in the area of my right hip. I have progressive arthritis in my thumbs in both hands. My main issues are low back pain, hip pain and that I cannot walk any distance without the pain kicking in. I do many things to strengthen my back muscles and to heal my body from many angles.The Heal-n-Soothe® and Rub on Relief® have been a Godsend and have made it possible for me to do the many things that I do from personal exercise to yoga, to other activities in my life. This is the first cream that I have found that helps with the pain in my hands. I found out how it would help me by using the Rub on Relief® to rub into my husbands back. After that I was able to use my hands to make my Thanksgiving dinner. 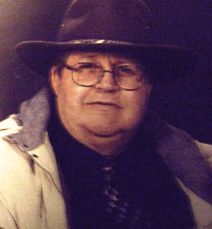 I have suffered with fibromyalgia for the past dozen years, have two knee replacements that haven’t healed correctly and pain from type 2 diabetes. In the past I was always taking some sort of narcotic and ibuprofen. At first I tried your Heal-n-Soothe pills and although they worked well, I switched to your Rub on Relief. I call it my own special “SNAKE OIL”! I began using it a couple of months ago and at first I applied a small amount perhaps three times a day and that rate of application kept decreasing until now I seldom need it, but still keep it on hand for any flair up. I love the stuff and the pain is completely gone, period! I have referred about seven of my friends and even strangers to the product and all of these folks tell me how well it works. I do use it for my arthritic pain too. 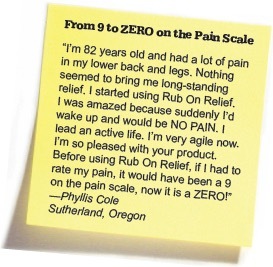 Thank you again for a wonderful product and please never stop making Rub on Relief®! "I live in Australia and finally decided to try Rub on Relief®… Almost immediately, I found my level of pain reduced dramatically. My only regret is I should have tried this product sooner." This cream is the closest thing to a miracle for me. After 2 back surgeries and 5 years of pain, this cream gives me hours of relief. I'm walking more, even doing mild aerobics again. I'll keep it on hand. Thank you so much! May God bless you as you help others to have more quality life. Since a near-fatal reaction to combined medications in 1957* - my body does not tolerate drugs, so haven't been able to safely take any pain medication except Tylenol. *It was the combination of the two injection (the doctor was trying to help me) that kicked off my problems. Thankfully the dentists' use of novocane-type numbing medicine does work for me; and doctors worked with that info to find an anesthesia for each surgery. And as a side note:-This cream goes on much easier than cream prescribed for me by my Pain Mgmt Doctor. His prescribed cream does give me some relief, so it made me more than willing to try RUB ON Relief® cream. "This product appears to be working. I lift weights and do high intensity interval training. My knees have been bothering me for over a year and I also have chronic neck pain due to arthritis. In addition, all of my joints pop and crack regularly. I feel relief in just a short while after applying Rub on Relief®. Honestly, I can't believe how good this stuff works. I have very little pain in my knees, my joints pop and crack less, and my neck has less pain and more movement. This is only after using the product for about two weeks. It is eliminating years of discomfort. Right now, I'm a happy guy." Q: What is Rub on Relief® Herbal formula? A: Living Well Nutraceuticals® is truly excited to partner with The Healthy Back Institute in launching the All-New Rub on Relief® Herbal Formula. This will be our most advanced/comprehensive formula to date, in part because we are using a blend of whole plant oils and some powerful plant extracts all of which have beneficial components that our bodies use on a daily basis. We have chosen to fuse Cinnamomum Camphor and Peppermint Leaf Oil as there are some very powerful naturally occurring compounds in each of these components, including menthol that feels cool and Camphor that feel warm, but what is even more compelling are the additional compounds found in both of these oils, that you may never have heard of but are the secret sauce to this formula. We can call these next four extracts “The four princes of plant-based relief” they are Arnica Montana flower extract, White Willow (Salix Alba) Extract, Turmeric (Curcuma longa) extract and Boswellia Serrata extract, either one of these alone will help support your muscles and joints but together, they are blueprint for a resilient body. No, topical cream should be without a strong citrus blend so we added Lemon (Citrus limon) Oil and Lime (Citrus Aurantifolia) Oil, for their impressive health benefits including antiseptic, antiviral, astringent, bactericidal, disinfectant, febrifuge and not to mention they provide a very faint yet pleasant all-natural fragrance. I bet you have never heard of Calendula (Calendula) Officinalis Flower Extract, we added it because it contains a bioactive compound called Sesquiterpenoids and these Sesquiterpenoids have been found to be antimicrobial and have anti-inflammatory properties. Please note, the base formula for Rub on Relief has not changed, with that said, we invite you to feel the difference it can make for your sore muscles and achy joints, without a prescription or harsh chemicals or obnoxious odors, just powerful natural ingredients to support you in your active and busy life. Q: Who can use Rub on Relief® Herbal formula? A: Athletes actively involved in Golf, Swimming, Tennis, Running, Triathletes, Mixed Martial Arts and even Pickle Ball for post-workout recovery and a training advantage... Health Practitioners including Doctors, Chiropractors, Massage Therapist and Naturopathic doctors. People actively involved in Hobbies like Gardening, Weekend Warriors and those looking for improved Pliability of their muscles and joints... 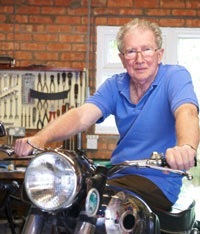 The age range of our users is between 10 and senior citizen. Those that DO NOT want to take oral pain medications. Q: Where on the body can Rub on Relief® Herbal formula be used? 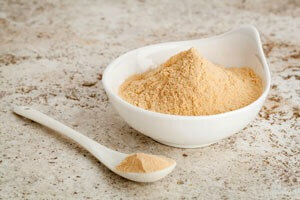 Q: What ingredients are in Rub on Relief® Herbal formula? Q: What is the suggested usage for Rub On Relief Herbal formula? A: Apply a dime size portion to the affected area up to 4 times a day as needed. Massage into affected area until lotion is fully absorbed into the skin. Children under 10 yrs. 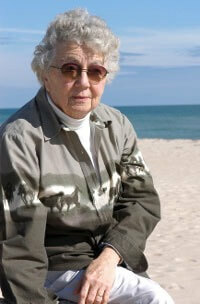 of age, It is suggested that you consult a physician before use and applied only by an adult. Please keep out of reach of children at all times. Q: What ingredients were NOT used in the Rub On Relief Herbal formula? A: Please read the complete label before use, ensuring you understand what is in the product. Do not use if you now our suspect that you may be allergic to any of the ingredients. 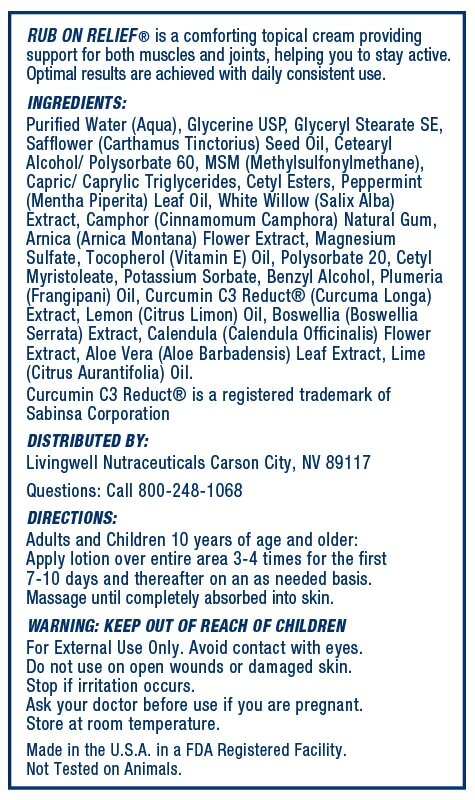 In compliance with the Food Allergen Labeling and Consumer Protection Act of 2004, the manufacturer declares that Rub on Relief Herbal formula does not contain any ingredients that contain protein derived from an of the following major allergenic foods or food groups: Eggs, Fish, Shellfish, Milk, Soybeans, Tree Nuts, Peanuts or Wheat. Q: How long should one application of Rub On Relief Herbal formula last for? A: Everybody’s different but on average you can expect hours of relief from each application. What long-time users have told us is that the more consistently you use the product, the more effective it is over time. Remember that you can apply more as needed throughout the day. Q: Will Rub on Relief Herbal formula interfere with any of my medications? A: Please understand that while Rub on Relief Herbal formula is a natural product, it powerful and we have to suggest that you consult your physician before use as only they know you're complete medical history and only they can give you a complete and appropriate answer based on their medical treatment plan they have set for you. Q: Does Rub on Relief Herbal formula feel hot or cold when using? A: You could feel both: We have chosen to fuse Cinnamomum Camphor and Peppermint Leaf Oil as there are some very powerful naturally occurring compounds in each of these components, including menthol that feels cool and Camphor that feel warm, please understand that the effectiveness is not dependant on the cooling sensation you will feel. Q: Can Rub On Relief Herbal formula be used over a large part of the body? A: We only suggest that you apply the lotion to targeted body parts, (as needed) do not attempt to cover large parts of the body with a single continuous application. Q: How long should one tube of Rub On Relief Herbal formula last me? A: That depends entirely on how you use it. The Tube contains 3 oz and should last you many many applications. Q: Is Rub on Relief Herbal formula safe for long term continuous use? A: Yes. Some people have used the formula Rub on Relief for years. Q: Who should NOT use Rub on Relief Herbal formula? Q: What other natural Products will work with Rub on Relief Herbal formula? Q: Can I buy Rub on Relief Herbal formula in Stores? A: No, Rub on Relief Herbal formula is sold exclusively online through The Healthy Back Institute…. Q: Can I use Rub on Relief past the expiration date on the tube? 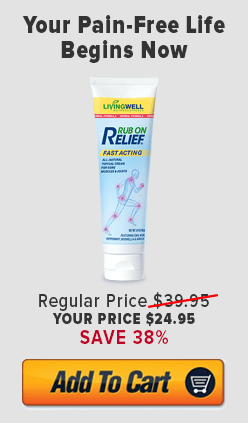 A: We can not suggest or support the use of Rub on Relief past the expiration date on the tube. If you choose to take the product past the expiration date you do so at your own risk. Q: What is the shelf life for Rub On Relief Herbal formula? Q: Is Rub on Relief Herbal formula, 100% certified vegan product? A: No, Rub on Relief is not a 100% certified vegan product. The Cetyl Myristoleate (CMO) is animal sourced.